Philadelphia. The last big city of the east coast which I had yet to visit. In previous years I managed to visit the likes of Boston and New York to the north as well as Baltimore and Washington DC to the south, but somehow Philadelphia had always eluded me. That changed in May when I finally managed to get there. It is shame I waited so long as Philadelphia is a really interesting place: a great mix of history and a modern vibrant culture. I started my visit from the touristic heart of the city, the Independence National Historical Park, which preserves several sites associated with the American Revolution. The most important of them is of course Independence Hall where both the Declaration of Independence and the United States Constitution were debated and adopted. The red brick building, which was once the colonial legislature for the Province of Pennsylvania, was completed in 1753 in the Georgian style and is nowadays a UNESCO World Heritage Site. You can visit it for free but you still have to get a ticket and go through the airport-style security checks. Tickets are timed and go fast so if you really want to get inside, make the Independence Visitor Center your first port of call in Philadelphia. Across the street from the Hall, the Liberty Bell, an iconic symbol of American independence, is displayed in the modern building of the Liberty Bell Center. You still have to queue to get in there and go through security but you don’t have to get tickets hours in advance, like for the Independence Hall. Or, alternatively, you can simply see the bell through the panoramic glass facade. The park also contains other historic buildings like the first Bank of the United States, the Carpenters’ Hall, the Congress Hall, where the Bill of Rights of the US Constitution was ratified, and a few other less popular sites. The Independence Park is a must-see place for anyone interested in history of the United States. It is here where many of the pivotal events that shaped that country took place. But history is everywhere in Philadelphia. 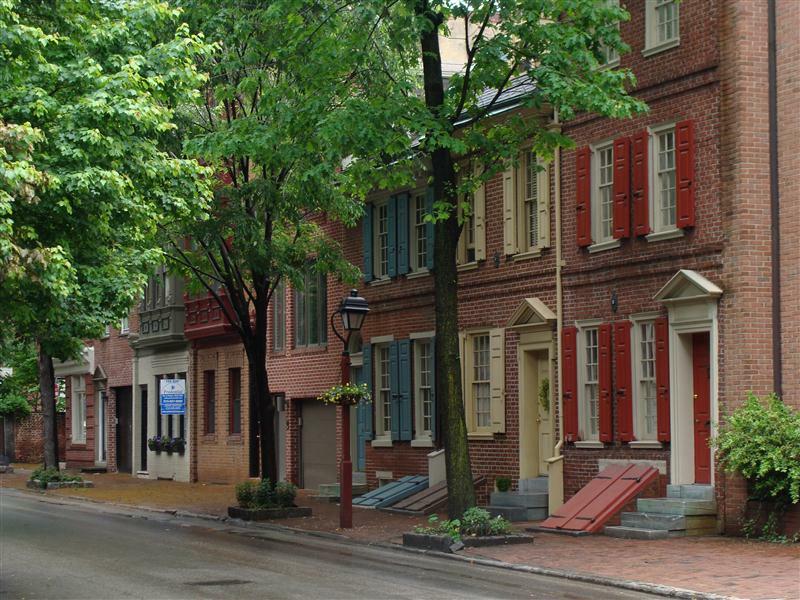 From Independence Mall I headed south to the lovely preserved neighbourhood of Society Hill. Here you can find the largest concentration of original 18th- and early 19th-century architecture of any place in the United States. It is a really charming district with cobblestone streets bordered by brick rowhouses in Federal and Georgian style and mature trees offering shade, a perfect place for a peaceful walk as most tourists don’t venture this far south. From the oldest part of Philadelphia I walked westward towards its modern and busy downtown. And it doesn’t get any busier than Penn Square which is the centre of the gridiron of streets provided for in William Penn’s original plans for the city. 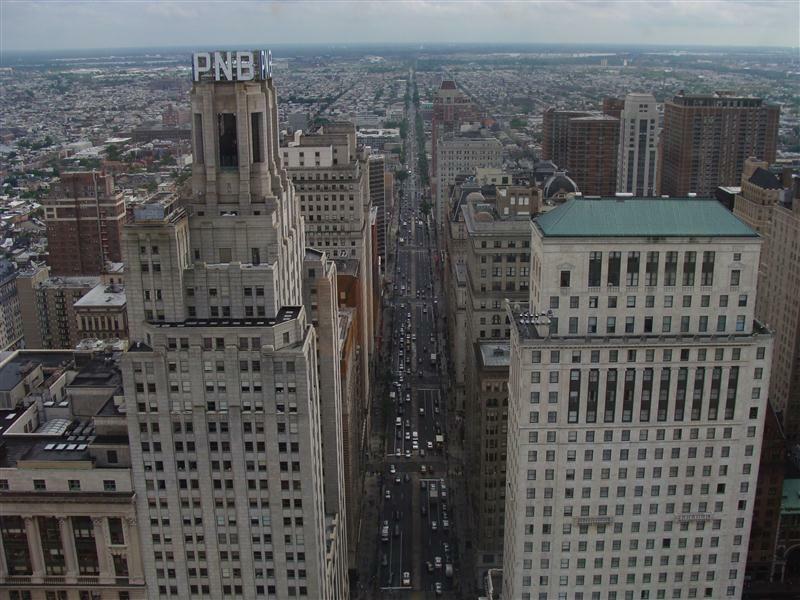 Penn Square is at the intersection of north-south running Broad Street and east-west running Market Street, which are the city’s main thoroughfares. On the square is located one of the most grandiose municipal buildings in the world, Philadelphia City Hall. At 167m (including an 11.3m, 27-ton bronze statue of city founder William Penn), it is the world’s second-tallest masonry building. It is also the largest municipal building in the United States, with almost 700 rooms. To get to the observation deck (located directly below the statue, 152m above the street) you have to obtain timed tickets. It seems like you need timed tickets everywhere in Philadelphia nowadays, but you will understand why it is the case here once you step inside the tiny, claustrophobic 6-person elevator. It has glass panels so you can see the superstructure inside the tower and it shakes quite a lot while it slowly inches up, so the ride is actually quite scary. But the view from the deck justifies everything. The first thing you might notice will be the perfect grid layout of the city, with its main streets running dead straight. 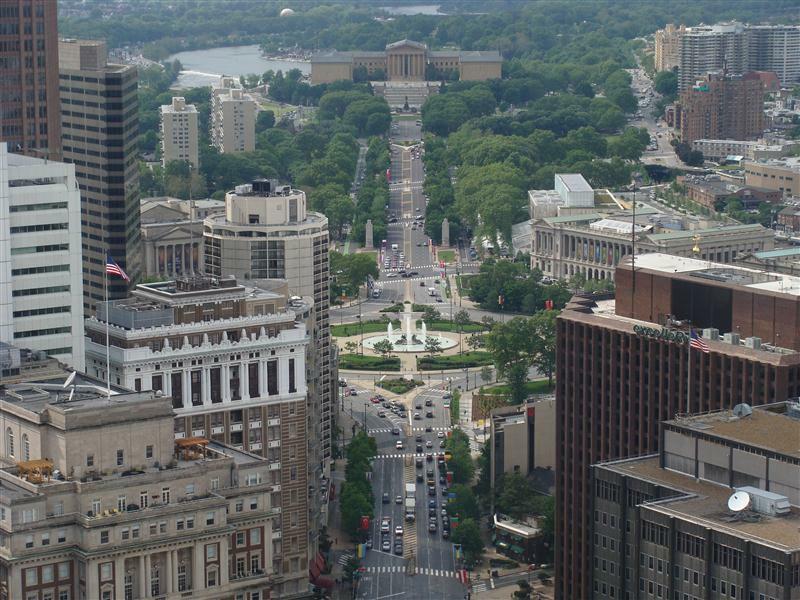 One exception is the tree-lined diagonal axis of Benjamin Franklin Parkway running north-west towards the Fairmount Park. West of the city hall you can admire the modern glass towers of the financial district. The most impressive of them are Comcast Center, which at 297m is the tallest building in Pennsylvania, and One and Two Liberty Place, which are two interesting towers of a single complex. Two blocks east of the city hall is located Reading Terminal Market which occupies the ground floor of a former train shed, now part of Philadelphia Convention Center. The market is a real culinary heaven, full of traders selling fresh produce but also stalls serving a mouth-watering array of foods and treats. I decided to go for the famous Philly cheesesteak (which was delicious) but you can get anything there, from seafood to cookies and from Chinese food to ice cream. Highly recommended. From the Penn Square area I headed north-west towards Fairmount Park. This part of town is dominated by some truly great museums, such as the Franklin Institute Science Museum, Academy of Natural Sciences Museum and Fels Planetarium, all located around the magnificent Logan Circle and its Swann Memorial Fountain. But I didn’t stop there and walked all the way to Philadelphia Museum of Art, located at the end of the scenic boulevard of Benjamin Franklin Parkway. Here I have to admit that I didn’t even bother going in. Firstly, I’m not really into art; secondly, it was getting late. But what I really came to see here was the building itself, especially its impressive steps which feature in the Rocky films. Yes, those are the steps that Sylvester Stallone ran up in the classic training scene before the fight. Nowadays you can see many people mimicking this famous run and taking pictures in front of the Rocky statue. Yes, there is also a stature for, what is in fact, just a fictional movie character. And yes, I have picture of it as well. The steps are a great place for people watching but they are also a great vantage point from where you can admire a splendid view of downtown Philadelphia at the end of the diagonal axis created by the Benjamin Franklin Parkway. I had a really good day in Philadelphia. I’m interested in early American history so all the historic sites were especially fascinating for me. If you have similar interest you won’t be disappointed. As a geographer with interests in urbanism I was also fascinated by the city’s regular grid layout, which is best seen from the tower of the city hall. Philadelphia was designed on a rectilinear street grid in 1682; one of the first cities in North America to use a grid system. At the urging of city founder William Penn, surveyor Thomas Holme designed a system of wide streets intersecting at right angles between the Schuylkill River to the west and the Delaware River to the east, including five squares of dedicated parkland. But there is much more that this city has to offer, like a nice walkable downtown, good food at the Market, lovely green squares and impressive buildings. So you should like it too, even without my interests and obsessions. This entry was posted in Uncategorized and tagged Benjamin Franklin Parkway, Independence Hall, Independence National Historical Park, Liberty Bell, Logan Circle, Penn Square, Philadelphia, Philadelphia City Hall, Reading Terminal Market, Society Hill on September 1, 2012 by admin. This is the first time I’ve looked at your blog – after the last couple of Maine posts on SSC I thought I’d check it out. Good work, and nice post about the city I chose to live in.